Mixer: Exceptional reliability defines this Bosch Mixer! Thanks for the info! That was a great video. We have owned our Bosch mixer since about 1975, so it's a fantastic value costing us only about $12 a year at even the current prices. I've had my Bosch mixer for 24 years now and it's still working great! Just thought you'd like to know that they last a really long time. I used to work for Bosch and I know how wonderful their products are. I recommend the Bosch mixer to all my friends. We've had a Bosch Mixer since 1990 and have never regretted the purchase. Enjoy your new toy! I still thank my husband often for giving me one of those machines so many years ago. Wow! That video is way awesome. Growing up my mom always had a Bosch Mixer and I think that now her's is about 25 years old right now and still going strong! Thanks for passing along the info and offer. I just have to tell you that I have been using a Bosch Mixer since 1986 and if I have a bad batch of bread it is my own fault. I use it for everything. I also have the food processor as well as the blender. I can't recommend it enough. I hope you keep recommending it on your site so that more people can enjoy it. Thank you for the email! I have had a Bosch Mixer for 20 years now and when each of my children have gotten married they have always asked if they should get a kitchen aid or a Bosch mixer. I tell them a Bosch mixer hands down. It is by far the better machine. The family has gone in together for wedding presents and bought them each Bosch mixers. I make whole wheat bread in it every week. We love it. I've had a Bosch Mixer / bread machine / foodmill / meat grinder since the late 1960's and love mine!!! I still do all my quick breads with it and you can never make a bad pie crust!!! I use it for bread doughs even tho' I have a Panasonic Bread Machine--Just like handling dough!! I purchased a Bosch mixer when my children were young, probably 25 years ago... I absolutely love it, and I hesitate to buy a new one when the old one works so well. I've never felt the need to buy any other mixer because of the excellence of the Bosch. Thought you might be interested to know that I have had my Bosch Mixer for nearly 17years. I use my Bosch nearly every single day. No one can believe that my bread is truly 100% whole wheat because it's so delicious and not the least bit heavy! I can't possibly find the words to recommend the Bosch mixer / breadmaker / blender and the grain mill enough. It has more than paid for itself!!! Reliability and performance at its best! 800 watts of motor power for exceptional ice crushing, mixing and blending. 3 year motor/ transmission warranty. CD for only 1 penny more when you order today! With the most powerful motor on the market, the Bosch Mixer Universal Kitchen Machine outperforms all other small kitchen appliances. The large mixing bowl kneads up to 12 lbs. of dough and the high-speed blender harnesses a 700 Watt power motor for exceptional ice crushing, mixing, and blending. Special attachments eliminate the need for additional kitchen appliances. All Bosch Mixer attachments are dishwasher safe (except drive unit for twin beating whisks). The system includes plastic bowl, dough hook, whips, splash ring, and cover. Exceptional reliability and long service life. 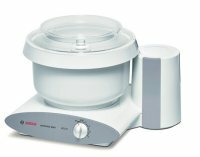 This Bosch Mixer attachment easily grinds raw or cooked meat, poultry, and fish, and also grinds vegetables and cheese. Made of metal and rugged plastic, the grinder comes with a stainless-steel 4-blade cutter and a 4.5-millimeter disk. The 4.5-mm disk is perfect for meats and relishes. The grinder is capable of processing up to 4 pounds (1.9 kilograms) per minute. It disassembles easily for cleaning.